How many mats should be used? The use of two mats is most common — a wide outer mat, plus a narrow amount of inner mat exposed from under the outer mat. The color of the outer mat is often selected to expand the feeling of the image being framed. The color of the inner mat is often chosen to accent the focal point of the image. Sometimes no mat at all is most appropriate. Sometimes six mats might be most appropriate. Whatever is most effective for any particular image is the determining factor. 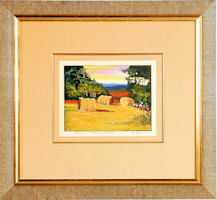 Keep in mind that the effect of matting should always be to enhance the artwork, and not overwhelm it.